Drive your own car on the World Grand Prix Circuit! The circuit, which is fitted to international standards, is the stage of fierce domestic battles, such as SUPER GT, SUPER FORMULA, All Japan Road Race, and many others. You can enjoy and have fun driving down the circuit with motorbikes or automobiles that you normally drive with. Go and head over to the circuit feeling like you are a GP rider or a racing driver. Please enjoy the touch and experience of the "real" thing. A genuine Marshall (pace) car used in a race will lead you. You drive or ride 2 laps around the 4.8km racing course. You can take photos of yourself with your vehicle in the main straight at the race track after the Circuit Cruise. 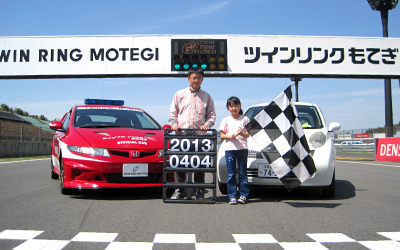 3,300yen for regular passenger or mini cars. Valid up to the maximum allowable number of passengers per car. Displacement of more than 125cc. Total passenger limit is as same as the motorbike passenger limit. Limited to those staying at HOTEL TWIN RING or Camp Village. * Payments can only be made at the Control Tower. Enjoy the experience driving/riding following the pace car. Overtaking the pace car or other participant's cars/motorbikes is strictly prohibited. If you drive/ride irregularly or in a dangerous manner deliberately, the circuit cruise will be stopped immediately. * We accept reservations only by phone. Reservation capacity is limited. Please make reservations in advance. We accept groups from 15+. Call in advance for a date and time. Feel free for any inquiries. Accommodations for tourist buses and school trips can also be arranged. For tourist buses, an experienced staff will board the bus to guide you through the circuit cruise. * On Saturdays and Sundays please direct inquiries to the Reservation Center. Apply for Circuit Cruise at Control Tower. An experienced staff will explain about the cruise. 3 ) Now, to begin driving/riding! Line up in the pit lane by following a pace car. The cruise begins with a start-signaling countdown like the real race. Once the checkered flag is waved it's photo shooting time.